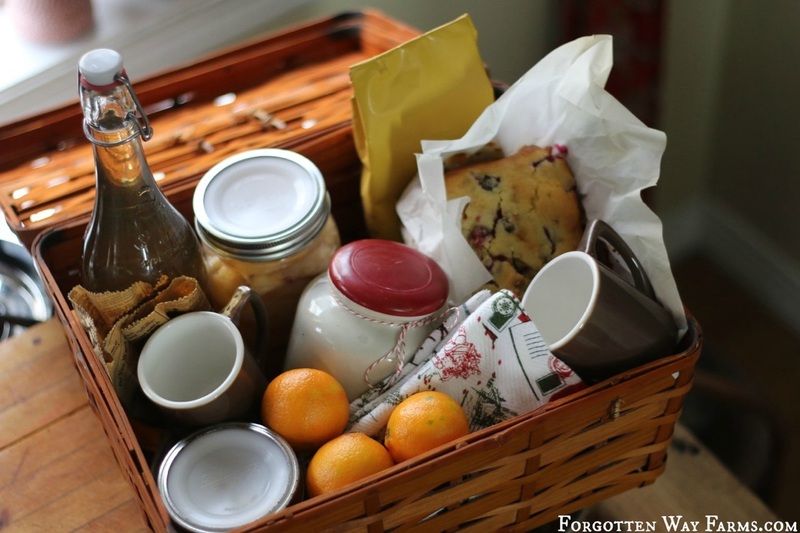 The Christmas Hamper, a perfect old-fashioned gift. 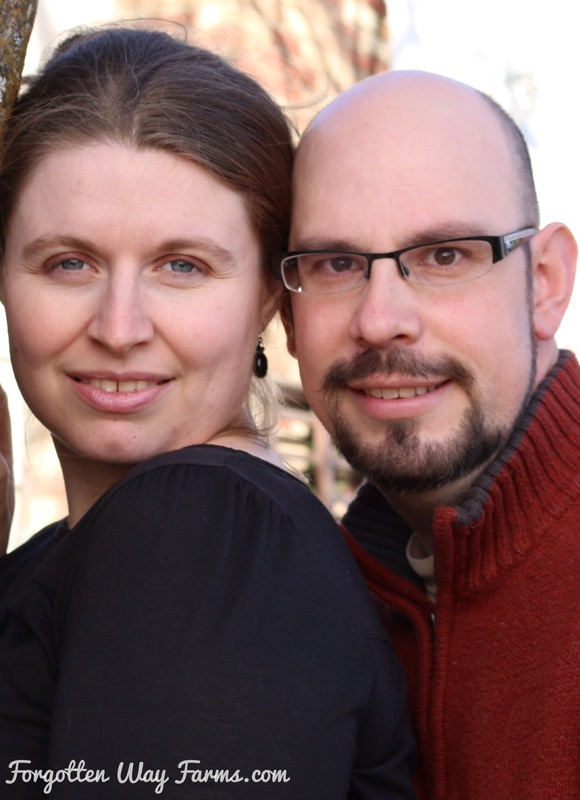 When Daniel and I started this homesteading journey long ago, I fell in love with the Christmas Hamper basket. We started out on our land building a homestead from scratch, we didn’t have a lot of money, but I loved giving gifts. Reading old books got me seriously curious about the old-fashioned idea of Hamper baskets. It seemed the perfect answer, I grew my own food, made my own soaps, candles, and herbal teas. To me, homesteading has always been about the food! And Christmas Gift Baskets are a perfect way to showcase the bounty from your homestead, along with seasonal favorites. In the video below I show you how to do just that! The tradition of giving hampers really started during the Victorian times, when wealthy families put together hamper baskets of food and drink for their staff, and the poor. There was often enough food for a week. The food, usually seasonal produce, would be enough for families to have a Christmas feast of their own. What is really interesting is that giving of hampers was often a charitable gesture, until a London department store caught on to the idea of sending hampers as gifts to family and loved ones. What a delightful tradition. 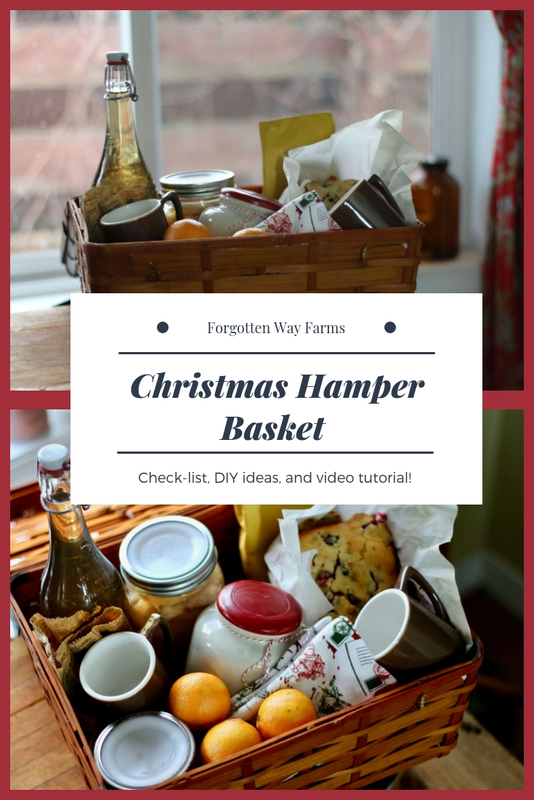 Here are my ideas for Christmas Gift basket ideas for families and friends that are simple, frugal, and you don’t have to worry about your gift going into a yard sale pile next year 😉 And really, I couldn’t think of a better way to share your own handmade delicacies. I collect unique hamper and picnic style baskets all year long, I often find my best ones at thrift stores (check out this post & video on my Top 12 Thrift Shopping Tips!). I also keep on the lookout for vintage mugs, teacups, and cool jars. 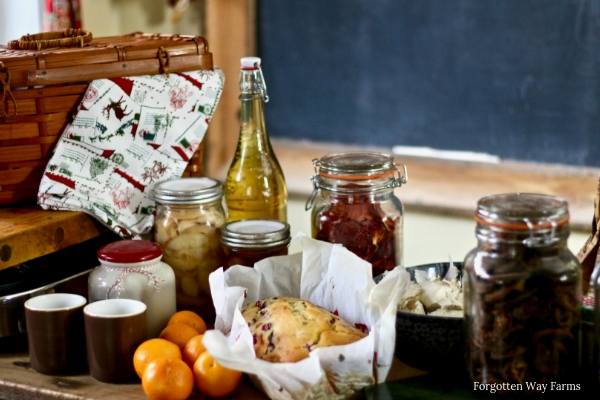 Here are a few ideas to fill your baskets brimming full with all kinds of Christmas goodness! Start out with a beautiful basket, jars, bags, tissue paper, twine, and labels. Fill your basket full, brimming is best. You want someone to feel blessed, loved and fed. Now, you may wondering what should be in a Christmas Hamper? Here is a check-list of things you might want to put in your Hamper Basket and some ideas for edible Christmas gifts to make in advance! You get the idea! Food, lots and lots of food. And I also like to add beautiful mugs, soaps, lip balm, candles, hand towels, heirloom seeds, and anything that adds a cozy charm to the hamper basket. 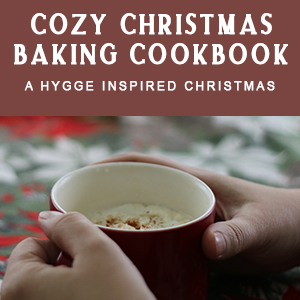 In my cookbook “Cozy Christmas Baking: A Hygge-Inspired Christmas” I have a chapter on Christmas gift baskets and over 40 plus recipes for bread, pies, cake, cookies, and sweet treats! Be sure to check out my cookbook trailer and review. Think about how everyone lives in different areas and climates and how unique and individual everyone’s hamper baskets could be! I hope you all revive this wonderful tradition on your homestead. Sending love, and holiday greetings from our homestead to yours.